 Exactly two years ago, the City of Brampton made a decision regarding the proposed Hurontario-Main Light Rail Transit (HMLRT) that is likely to cast a long, dark shadow over the future of the city. In a narrow 6-5 vote, a decision was made that stopped a modern, fast, and fully funded LRT system from entering the heart of the city. 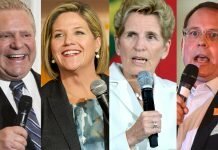 That decision was enough to turn down the Provincial funding on the table for LRT north of Steeles Avenue. The money is now gone. The original plan called for the HMLRT to pull straight into the heart of downtown Brampton, to the GO Train station. 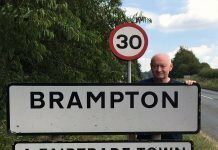 Its purpose: Connect Brampton and regional rail service to the rest of the Greater Toronto and Hamilton Area. 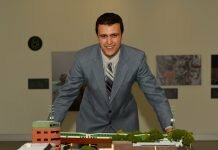 Recently, Ryerson University announced they plan to build their new university campus in the downtown Brampton area. 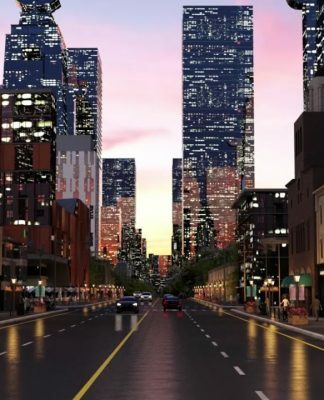 The colossal blunder of not seeing the future potential of the area and the benefit that high order transit would bring to future generations of this city, cannot be overstated. Long before the Councillors and Mayor assembled inside the Rose Theatre for what was to become a marathon meeting, the debate over the decision to proceed with Metrolinx’s plan to enhance transit and regional connectivity had led to many heated discussions over the issue. 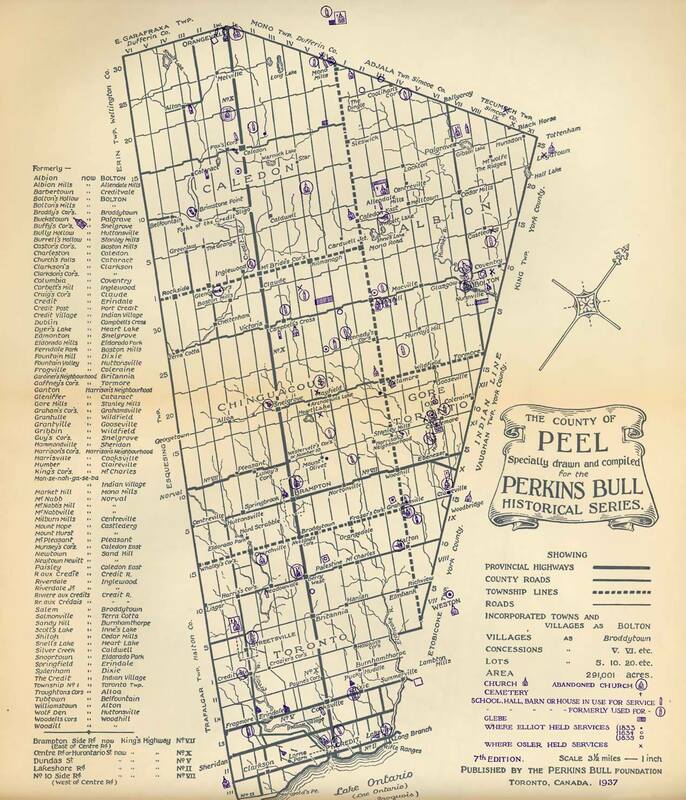 Map of Peel County, 1937. Notice the Hurontario-Main corridor clearly lineated as the principal north/south corridor, and the same as the proposed Metrolinx LRT route. 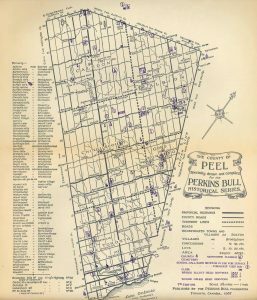 Never mind that, since long before any of these members of Council had even been born, the folks who ran the County of Peel in 1937 had maps drawn up that clearly show Hurontario Street as the de facto spine of the region. Yes, it’s true that beautiful, stately, homes line the east and west sides of Main Street within the core of the city, but, when the early families had those homes built, they realized that they were located on one of the only major north-south thoroughfares located for miles. For more than a decade, Main Street was slated for upgrade to LRT given the success of the Brampton Züm bus service which began service in 2010. Ridership numbers along that route, and indeed across the city, continue to outpace expectations. 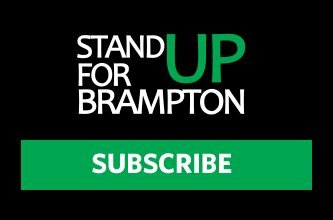 In fact, in October 2015, Brampton Transit ridership was 2,026,614. In September 2017, it was 2,619,854, a 29% increase in two years. Despite the rapid pace of transit growth, a few members of Council declared the mantra that, in this city, we had a preference, a desired order of preference, for our three major transit priorities: 1. To see All-Day Two-Way GO Train service delivered to our city; 2. 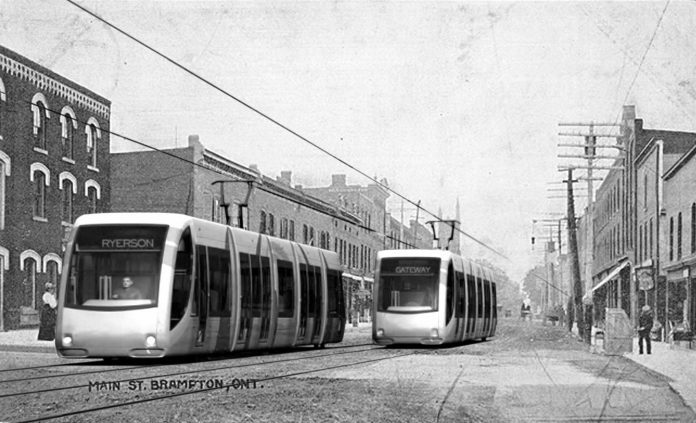 An LRT built on the Queen Street transit corridor; And finally, 3. An LRT on Main Street. This argument was used, like so many others, to derail and distract from the facts of the conversation. But who said these three priorities had to be achieved in that specific order? 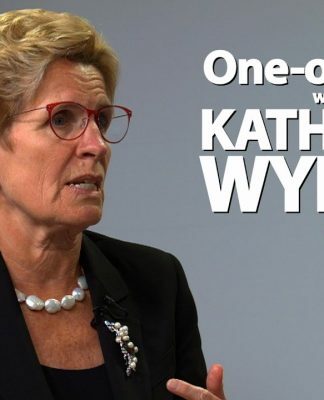 As if to help break the stalemate, the Province of Ontario rose to the challenge and delivered on the All-Day Two-Way GO promise two months before Councillors had to make their decision on the HMLRT, essentially adding more trains to the Kitchener line. That move was touted as the first step towards true Two-Way, All-Day GO train service to the region. 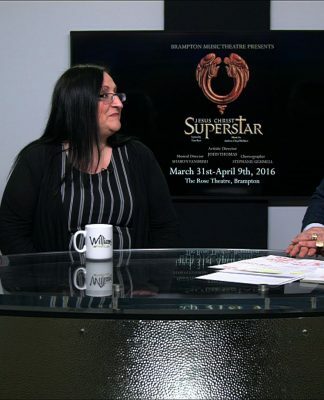 Since then, service levels have been increased even more, and there is a plan to deliver full service in the future. As for the Queen Street Corridor, plans to study options for higher order transit finally got underway in 2016. But for years, the City has been looking at ridership numbers along the Queen Street transit corridor and comparing them to the transit numbers on Main Street. Ridership on Main Street is growing faster, and is projected to be within threshold of LRT capacity sooner than Queen Street. In the meantime, the fallout from the October 27, 2015 decision continues to cause major headaches. Councillors who voted against the HMLRT plan began a push to find alternate routes for the LRT, even as they began to see issues with the “end of the line” at Shoppers World. 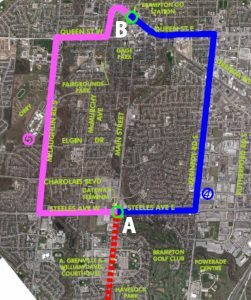 Three alternate routes were proposed: A route along the Etobicoke Creek, a route along McLaughlin Road, and one along Kennedy Road. The Etobicoke Creek idea, was a plan to route the LRT onto a valley that meanders past the downtown area and ends at Peel Memorial Hospital, as an alternative to the Main Street route. 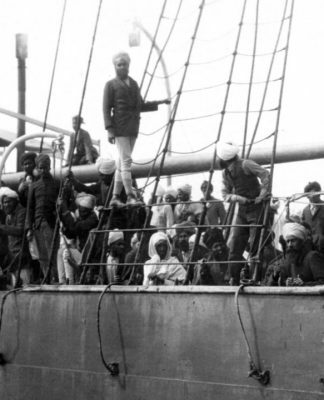 Staff warned the Councillors that such a route would not be possible, prompting responses such as, “If they can land on the moon, surely they can build transit along the creek.” A group naming itself “Stop The Creek Route” mobilized to oppose the idea and save the green space, and at a meeting of the Toronto Region and Conservation Authority, the idea was shut down by a unanimous vote, with members of the TRCA board declaring the idea as “nuts”. With only two options left, options that have been looked at previously and dismissed by experts and city staff, Council embarked on a environmental study to look at the routes, at a cost of $4.4 million. That study will take until 2020, and is unlikely to show those routes to be superior to the original Main Street route. The alternative LRT routes being studied. Back at Shoppers World, engineers and staff are facing a major challenge. Brampton is studying a left and right hand turn at Steeles Avenue to bring the LRT route up to the downtown GO Train station. With the Gateway transit teminal located on the north side of Steeles, all passengers will be required to disembark the Hurontario LRT on the south side, and cross the full width of the intersection (one of the busiest in Ontario) to complete their trip by bus. This poses a safety hazard and may now necessitate the construction of either a pedestrian bridge or a tunnel. It isn’t clear how much a tunnel or pedestrian bridge will cost, but since these changes are required to make the LRT route conform to Brampton’s plans, and are not part of the original route proposed by Metrolinx and fully funded by the Province, the capital cost, including the capital cost for building the alternate route, will not be covered by the Province; If these are ever built, it is expected to cost Brampton taxpayers hundreds of millions of dollars. And now, with the recent announcement that a university is being proposed by Ryerson for the downtown Brampton area, an influx of people are expected, and the decision made two years ago will be proven by history to be one of the worst ever made by a government on behalf of its residents; It takes vision to build the future, and six councillors didn’t see it. 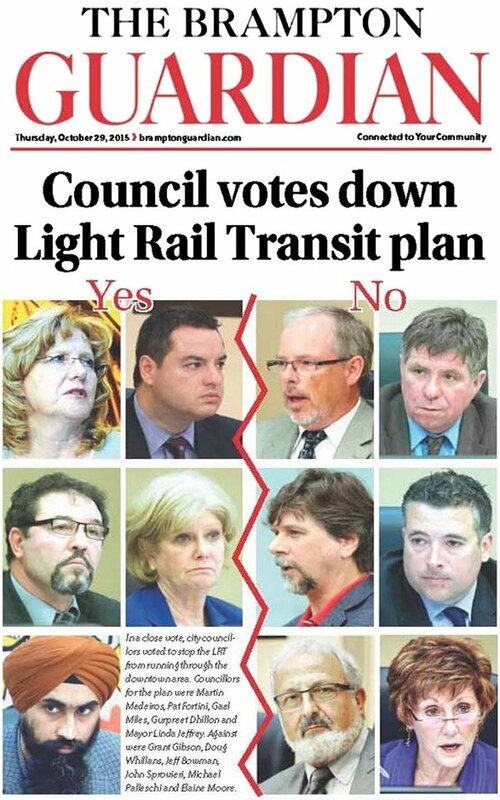 Front page of The Brampton Guardian, October 29, 2015, following the LRT decision.